Metacognition, an awareness and understanding of one’s own thought processes, is a part of metaliteracy can be leveraged to increase the effectiveness of information literacy instruction. . When students struggle with their research topics, information search processes, and their ability to use research effectively, much of that journey is invisible to their teachers and librarians. 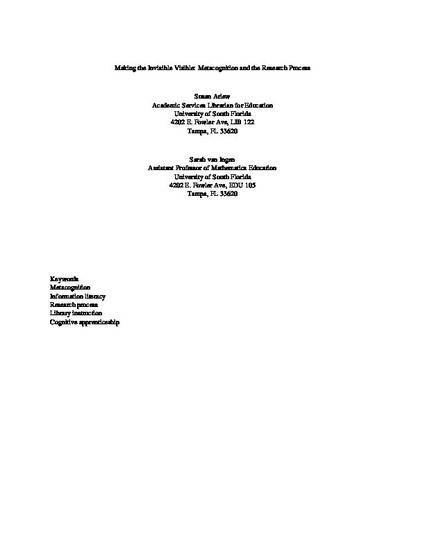 This presentation focuses on how to make the “invisible” more visible by asking students to reflect on their process, and by adjusting instruction to address some issues related to cognitive processes experienced by students.Authors of this paper share teaching strategies directly tied into metacognition and how those strategies can enhance library instruction and student success.